After Jesus was baptized, he came up from the water and behold, the Heaven were opened for him and He saw the Spirit of God descending like a dove and coming to Him. And a voice came from Heaven saying "This is my beloved Son, with whom I am well pleased." The Baptism given by Jesus, which the Church, faithful to his command, does not cease to administer, is quite different. 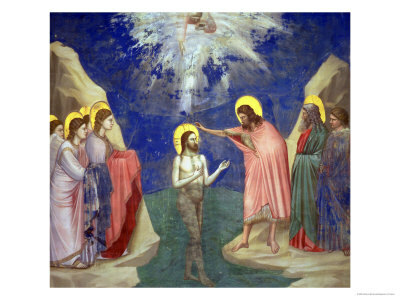 This Baptism frees man from original sin and forgives his sins, saves him from slavery to evil and is a sign of his rebirth in the Holy Spirit; it imparts to him a new life, which is participation in the life of God the Father, given to us by his Only-Begotten Son who became man, died and rose again. As Jesus comes out of the water, the Holy Spirit descends upon him like a dove, the heavens open and the Father's voice is heard from on high: "You are my beloved Son; with you I am well pleased" (Mk 1:11). Thus the event of Christ's Baptism is not only a revelation of his divine sonship, but at the same time a revelation of the whole Blessed Trinity. The Father-the voice from on high-reveals in Jesus the Only-Begotten Son consubstantial with him and all this comes about by virtue of the Holy Spirit who, in the form of a dove descends on Christ, the Lord's Anointed.